From last few years, around 31st October lot of statements from BJP stable have started coming which eulogize Sardar Vallabhbhai Patel. This year (October 2017) was no exception as Mr. Modi said, “I am from the BJP and Sardar Patel was from Congress, but I still follow his ideology and beliefs, which belong to no party,”. At the same time attempt is on to undermine Nehru; Modi had said Nehru that didn’t attend Patel’s funeral. These attempts of Modi-BJP have a political agenda. As BJP’s ideological camp did not participate in the freedom movement of the country, they do need an icon that was part of the freedom movement. This is why they want to iconize Sardar Patel. Since Nehru was the tall leader with secular values, they want to show him in a poor light. Motivated by this agenda they are desperately trying to make statements which create a falsehood of differences between Nehru and Patel. These statements eulogize Patel and undermine Nehru. BJP’s attempt to set opposition between the two major leaders of freedom movement is most despicable to say the least. In contrast to BJP’s attempt to create a binary between Patel and Nehru, the relationship between them was that of supplementing each other. There was no rivalry. Patel knew that Nehru was immensely popular. Commenting on the massive turn out in a rally Patel told American journalist Vincent Sheean, “They come for Jawahar, not for me.” At the same time Patel was the back bone of Congress party as an Organization. Gandhi who had mandate of the nation asked Nehru to take the responsibility of Prime Minister ship as he knew that Nehru had better understanding of the global politics and was very popular with the masses. In order to undermine Nehru Modi stooped very low when he stated that Nehru did not attend the funeral of Patel. This is a blatant lie. The Times of India, on front page had covered this event prominently and told the readers about the presence of President Dr. Rajendra Prasad and Prime Minister Pundit Nehru on the occasion. 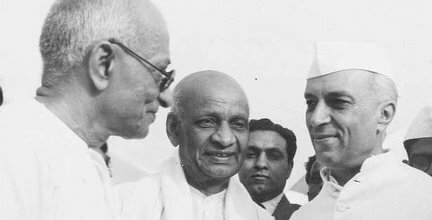 It also published the deep condolences of Nehru who said that Sardar Patel has contributed immensely to the process of India’s freedom and making of India. Congress Leader Digvijay Singh posted the clip of the documentary showing Nehru attending the funeral. Also Morarji Desai in his autobiography Volume I page 271, Para 2 mentioned the presence of Pundit Nehru on the occasion. In the face of this Modi later did retract the statement, and usual things about being misquoted etc were dished out, but this reveals his machinations for creating a naegative impression about Nehru. As Patel points out in his letters and interventions in Parliament, these two great leaders had a great rapport and respect for each other. The false propaganda of BJP will definitely bite the dust.